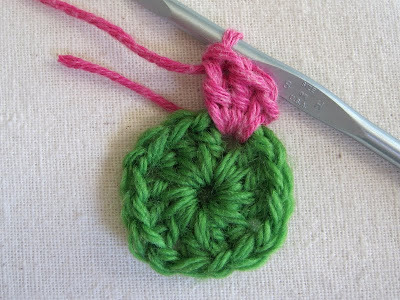 Waving to Granny is based on a slightly modified granny square, with flattened corners and minimal chain spaces. Since hat size is determined by the number of center increase rounds, you can use any yarn type/weight you like, with an appropriate size hook. Increase rows are added until the square's outside measurement is just under the diameter you'd like the hat to be; following rounds are crocheted even to make the sides. 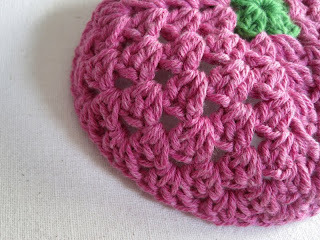 There are many lovely patterns out there that feature the traditional 3-dc granny stitch design on the sides of the hat, but I wanted one that looks like a granny square from the top - which allows for all kinds of fun colour play. (Though I played it safe on these baby versions, with just one contrasting round in the center.) 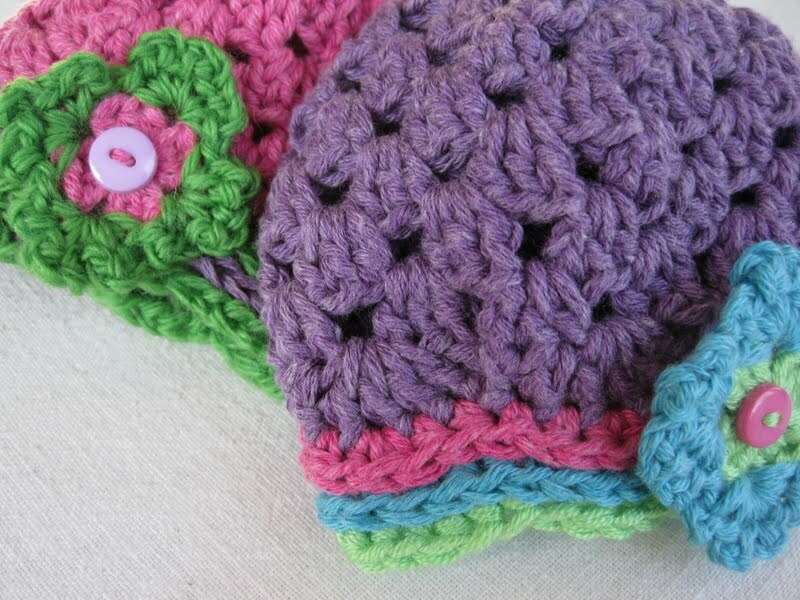 This pattern allows you to make the hat as varied and colourful as you like, while following authentic granny construction methods. ...which may be adorned to your taste. 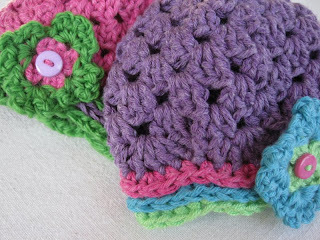 (I made lacy, buttoned, granny-centered flowers for Little K's hats). We'll start with the shorthand pattern, then follow it up with a tutorial in plain English. Because of the custom options, the directions look a bit wordy - but the pattern is really quite simple. How Did the Yarn(s) Behave? Very well. Plymouth Jeannee is a soft cotton (blended with acrylic to improve stitch memory) that works up into a cushy and comfortable fabric. It's a bit splitty, but the softness of the finished product more than makes up for it. Remember, you can use any yarn you like for this hat. 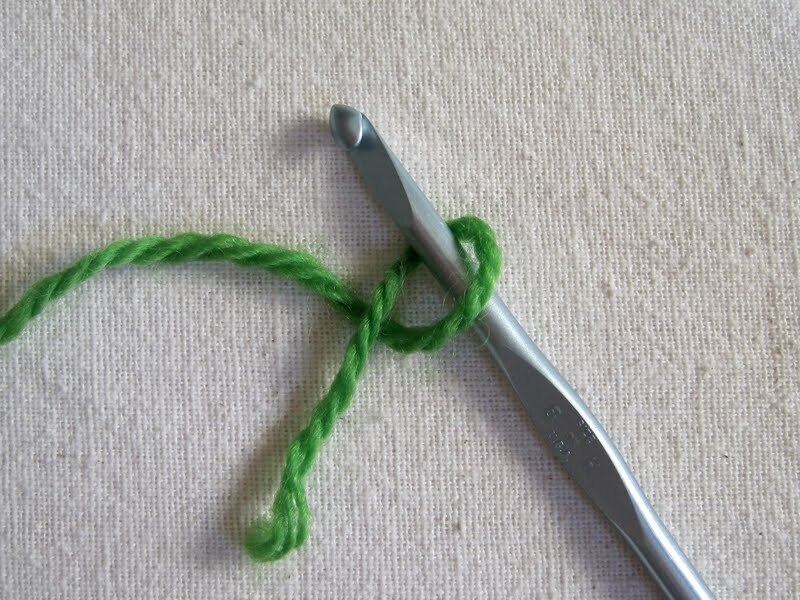 Choose a hook appropriate to your yarn. 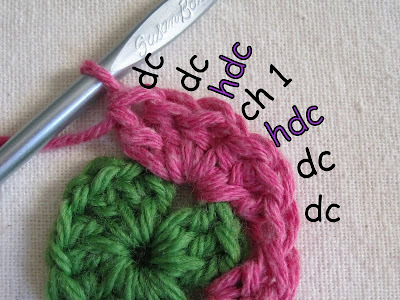 All crochet terminology is American. Make a granny square with no chains between shells. Chain 1 only at corners. 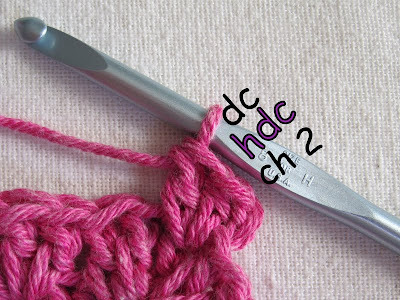 Make corners as follows: dc, dc, hdc, ch 1, hdc, dc, dc. 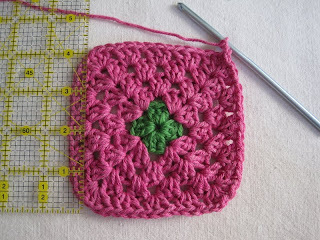 When outer border of square measures slightly less then desired circumference of hat, begin even rounds. In the first even round, make each corner as follows: dc, hdc, dc. Following even rounds consist of straight 3-dc shells in each space (no more corners). Finish hat edges as desired. Hat is worked from the top down. All joins are made by skipping over the initial chain stitches or knotless standing stitches which started the round, and joining to the next stitch. Do not chain between clusters; chain 1 at corners only. RS facing at all times. *If you're not changing colours after Round 1, do not cut yarn. Join w/sc to first dc and ch 2 to start next round. Round 2/First Increase Round: In ch-1 corner sp, attach new yarn* with Knotless Standing Single Crochet (or Kssc - click here for tutorial). Dc 2 in sp. (In next corner sp, dc 2, hdc, ch 1, hdc, dc 2) 3 times. Dc 2, hdc 1 in first corner sp. Join w/sc** to top of first dc. *If using same colour as last round, omit Kssc; instead dc 2 in sp. **If changing colour on NEXT round, cut yarn and join w/invisible join instead. Following Increase Rounds: Start round same as Round 2; dc 3 in each side sp; make corners same as Round 2. Continue Increase Rounds until edge of square measures slightly less than desired circumference of hat. First Even Round: Ch 2, hdc, dc in same sp. Dc 3 in each side sp across. *In next corner sp: dc, hdc, dc; dc 3 in each side space across. * Repeat from * to * around. 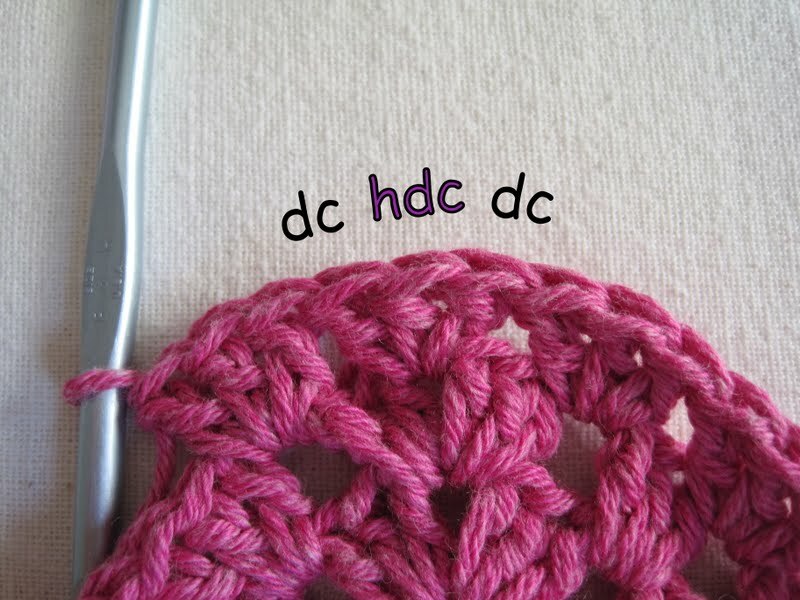 Join w/sc to first hdc. Remaining Even Rounds: Ch 2, dc 2 in same sp. Dc 3 in each sp around. Join w/sc in top of first dc. Work even rounds until hat is about 1 1/2" shorter than desired finished length. Final Round (Shells): Sc in joining sp. (Skip 2 st; dc in 3rd dc from hook, dc 3 in sp, dc in next dc; sk 2 st; sc in next sp) around. At end of round, do not make sc in starting sp (there's already one there). 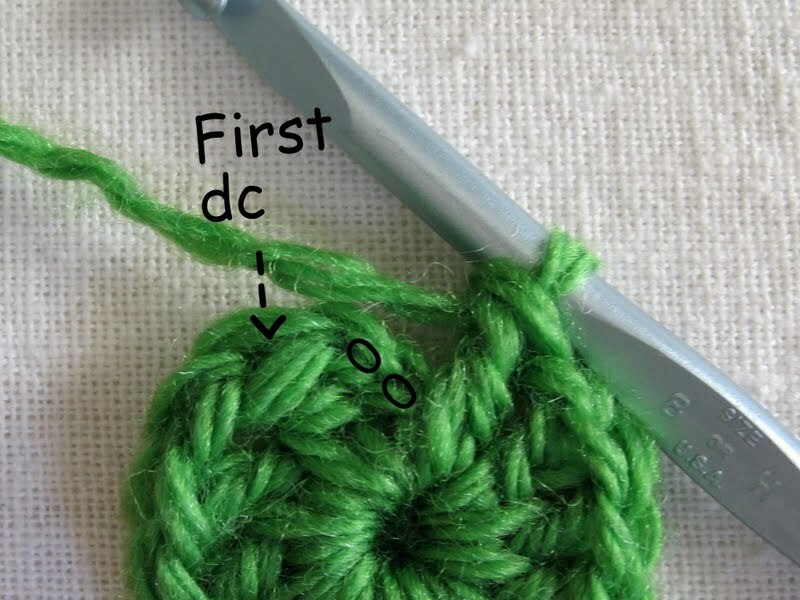 Cut yarn and join w/invisible join to first dc (skipping over first sc). 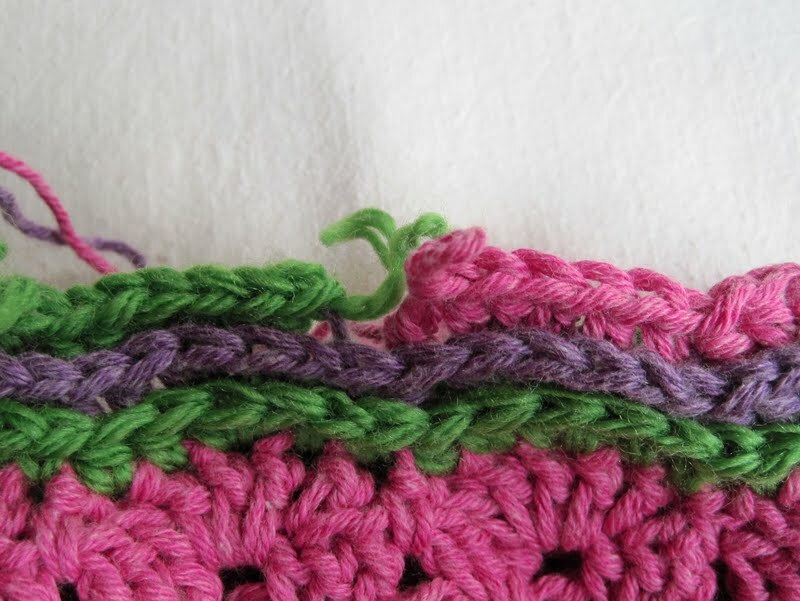 Wavy Trim Notes: Each "wave" contains 6 stitches: sc, hdc, increase (2 hdcs in same st), hdc, hdc, then skip a stitch. Increases should always be made in 2nd increase st of row below; skipped st is always the sc in row below. 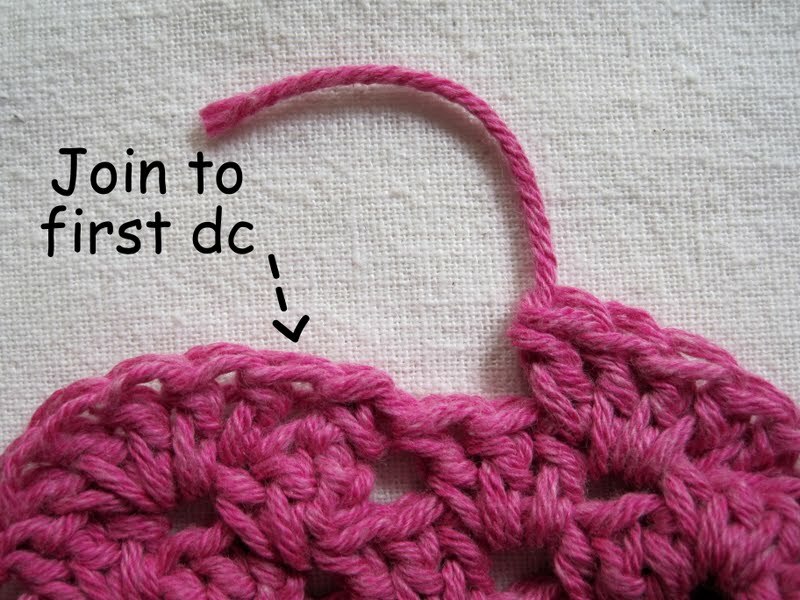 Wavy Trim Row 1: Attach new yarn w/Kssc in dc just after sc (the same dc you joined to in previous round). Hdc in next st, hdc 2 in next st (increase made), hdc once in each of next 2 st. (Skip 1 st; sc in next st; hdc in next st, increase in next st, hdc in next 2 st) around. 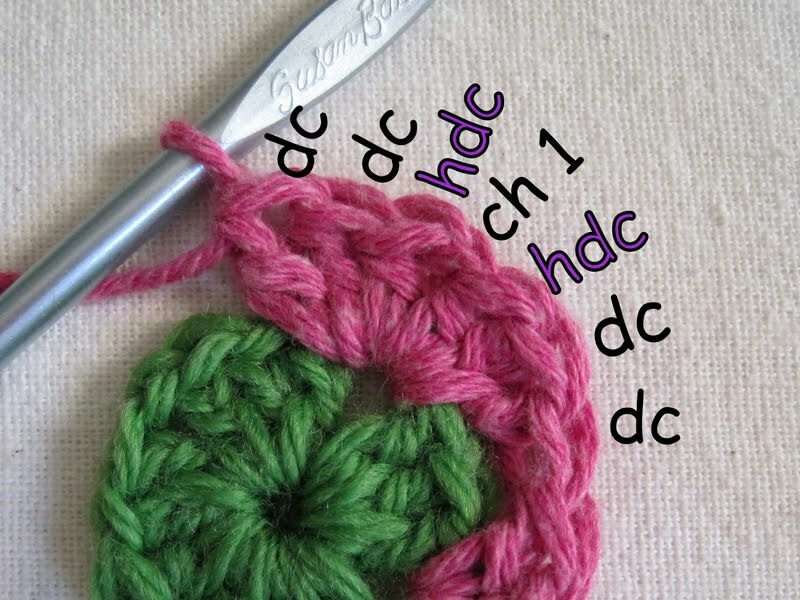 Cut yarn and join w/invisible join to first hdc (skipping over Kssc). Remaining Wavy Trim Rows: Attach new yarn in back horizontal bar of hdc just after sc. 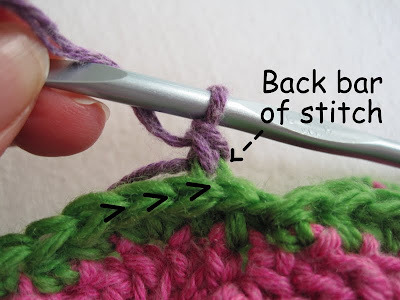 Make round same as Trim Row 1, except all stitches are made in back horizontal bar of stitch below. Make as many Wavy Trim rows as desired. When complete, weave in all ends. 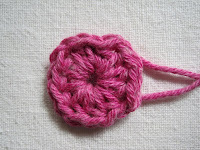 Optional Granny Picot Blossom: Leaving 6" tail, make core as in Round 1 above, using hdcs instead of dcs. Leave another 6" tail when core is complete. 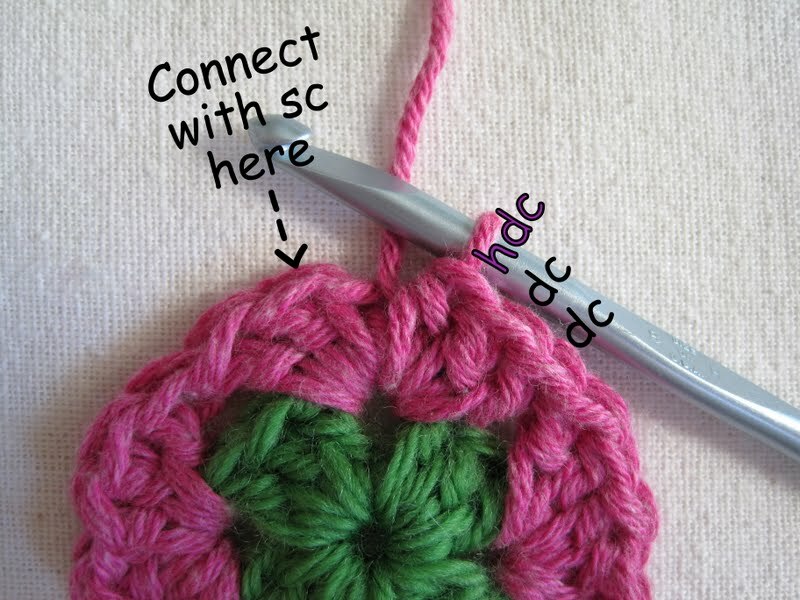 Attach new colour w/Kssc in any corner sp; (ch 3, sc) 3 or 4 more times (for a total of 3 or 4 picots, as desired) in same corner. *Sc in next corner sp; (ch 3, sc) 3 or 4 times more to match number of picots in first corner sp*. Repeat from * to * around. Do not chain between corner spaces. Cut yarn and join w/invisible join to Kssc. 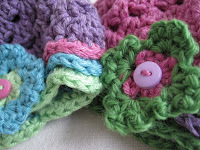 Use long tails from core to attach button to blossom and blossom to hat. 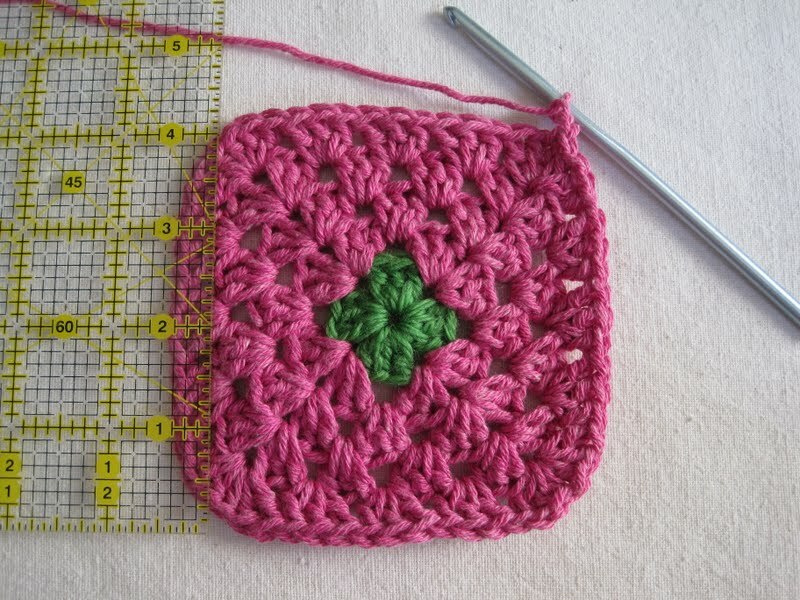 Because Waving to Granny follows the traditional granny square structure, you could make each row a different colour, or add coloured rows where you like to form stripes. 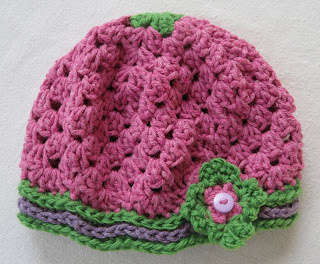 The shell round is quite pretty by itself - you could end the hat just there if desired. Add another border of your choice. 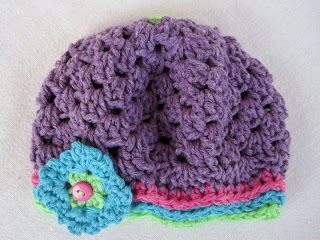 For a slouchier style, make the hat a bit loose, then switch to a smaller hook for the border. 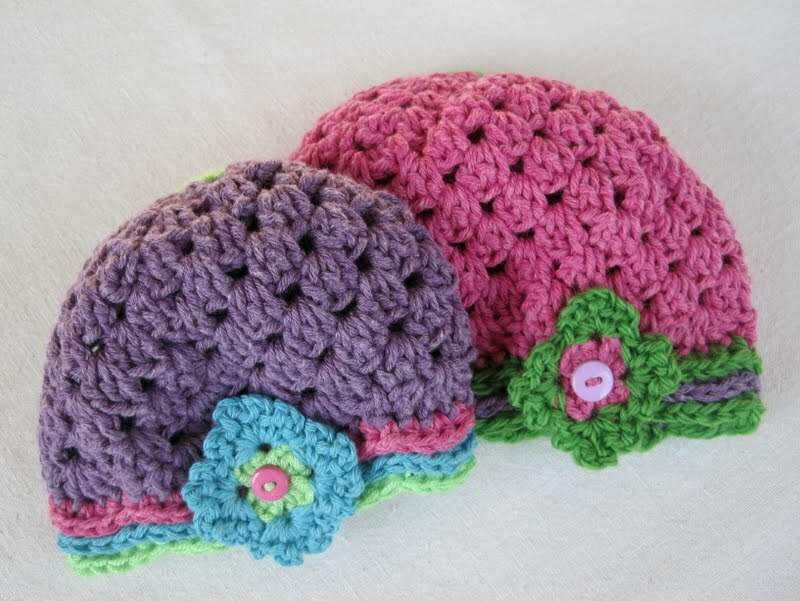 Due to the nature of granny squares, in which every round adds 1 shell to each side of the square, the circumference of the hat will increase by 12 double crochets (4 shells of 3 dcs each) with every increase row. 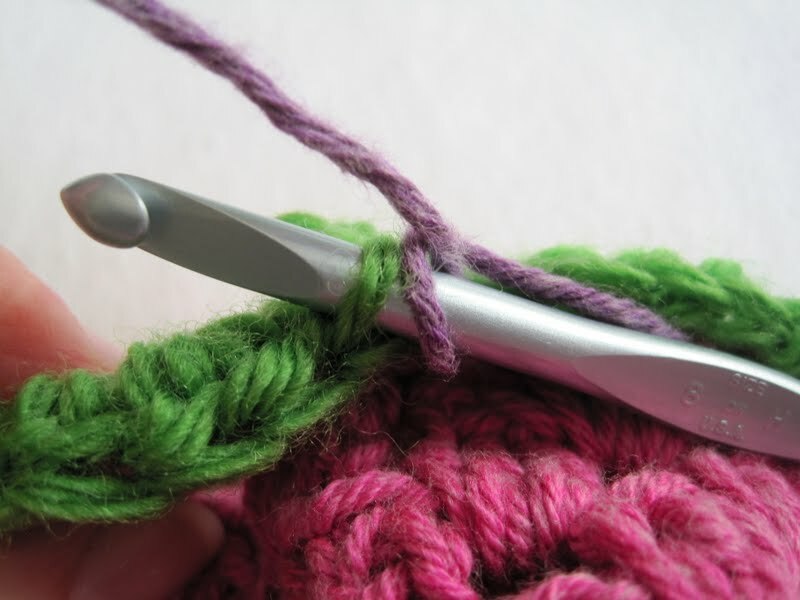 If you're using DK weight yarn (or lighter) and making a smaller hat, it's not much of a problem - but if you want to make an adult-sized hat with bulkier yarn, there can be a very large jump in size between one increase row and the next. If a hat is too loose, try switching to a smaller hook while keeping the same number of increase rounds. 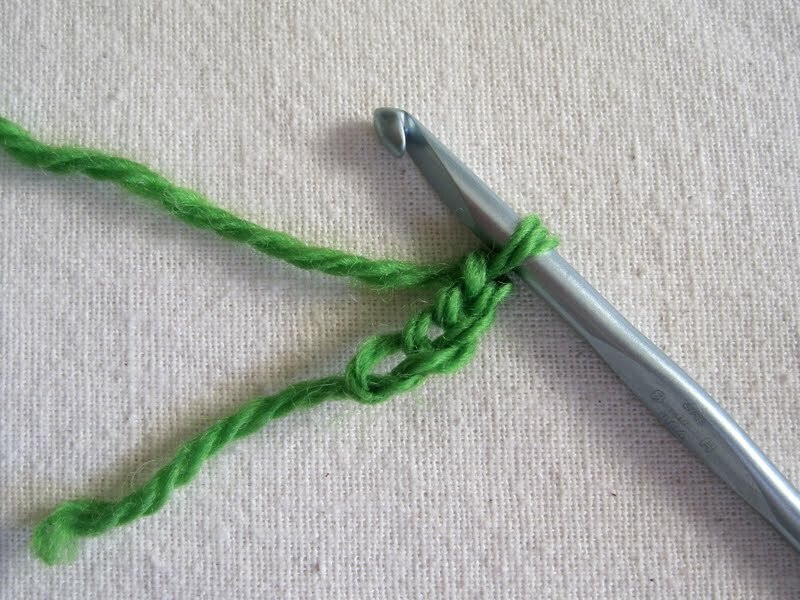 Or, if it's too tight, go up a hook size. 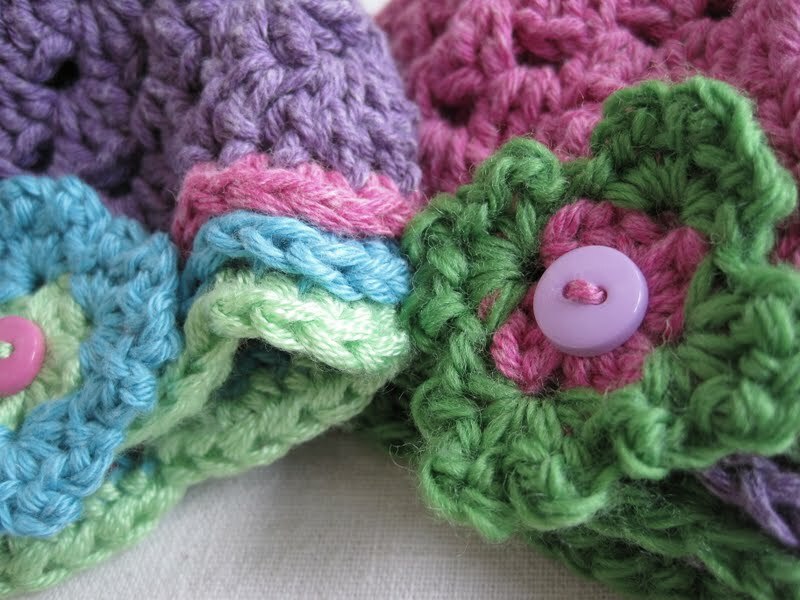 You can also change hook sizes as needed, before starting the even rounds, to give a little extra room or snug things up a bit. Or you can make the final increase round with increases in 2 opposite corners only, and plain clusters in the other 2 corners (this will give an increase of only 6 dcs rather than 12). 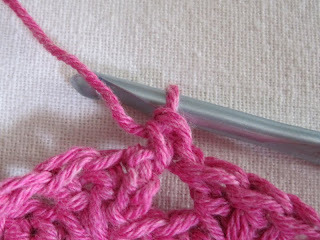 Round 1/Core: Knotless chain 4; join with slip stitch to form ring. *If you're not changing colours after Round 1, do not cut yarn. Join by making a single crochet in the top of the first double crochet, then chain 2 to start the next round. In any chain-1 corner space, attach new yarn with Knotless Standing Single Crochet (or Kssc - click here for tutorial). If using same colour as last round, skip to instructions just below photo. Double crochet 2 in same space. Repeat from * to * in 2 more corner spaces. 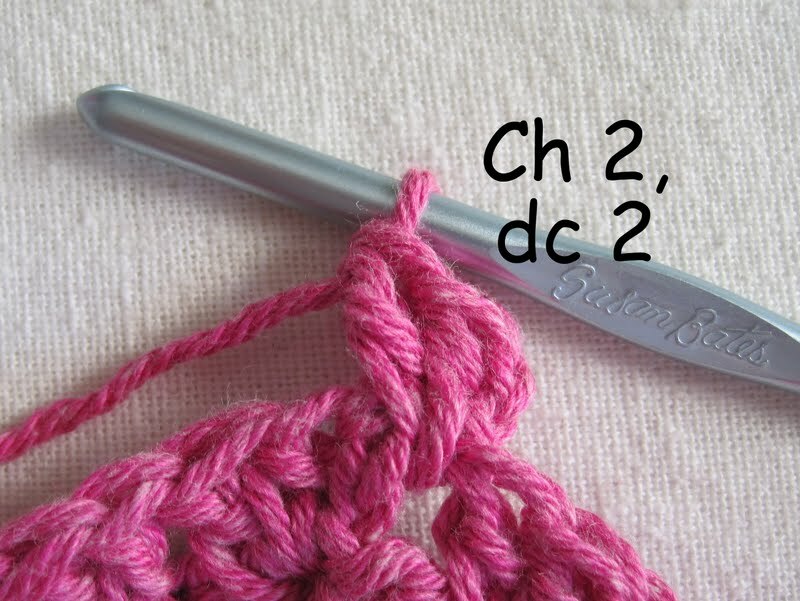 When you get back to the starting corner space, double crochet 2, half-double crochet 1. Join with single crochet to top of first double crochet (skipping over the starting stitch). 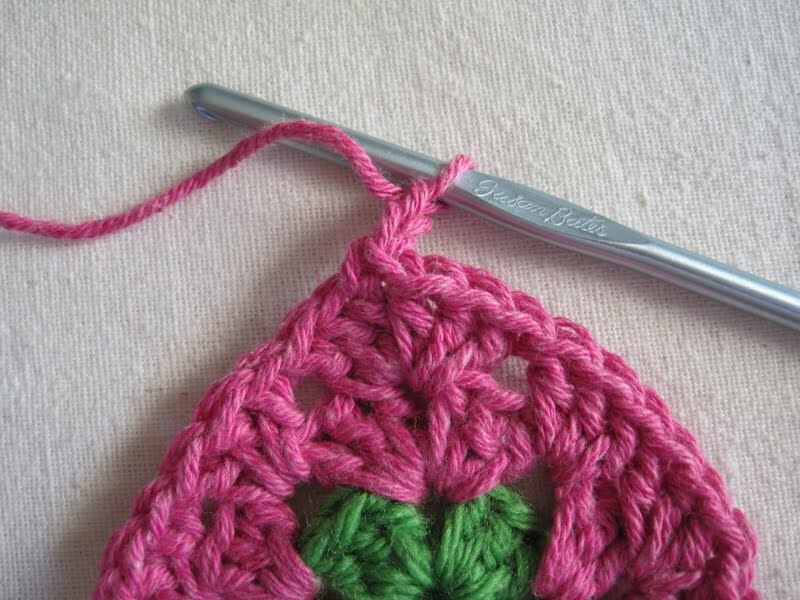 Please note: If you're going to start a new colour on the NEXT round, do not join with single crochet. Instead, cut yarn and join w/invisible join instead. To start the next round, chain 2. 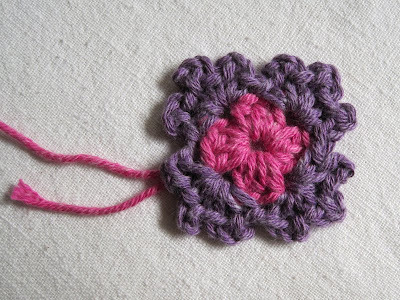 Stop for a moment and look closely at the space below the single crochet. 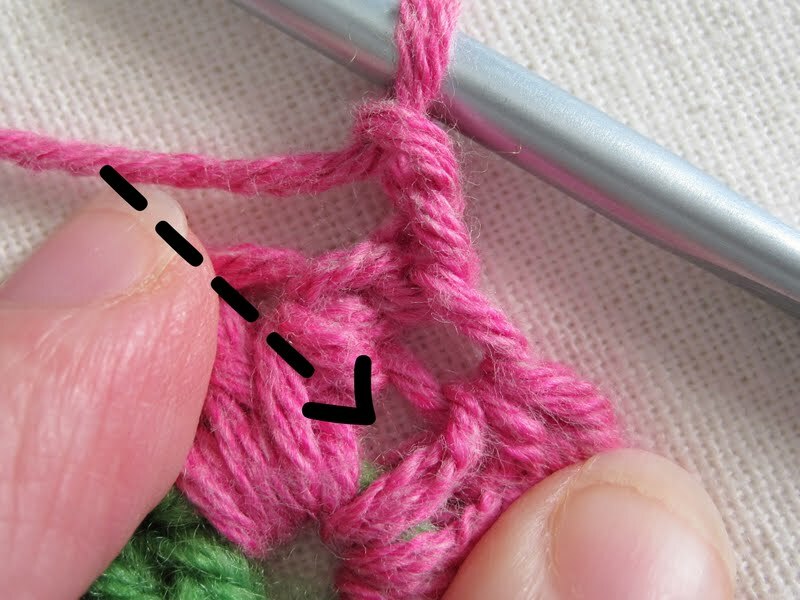 There is an extra strand of yarn that goes across the space. 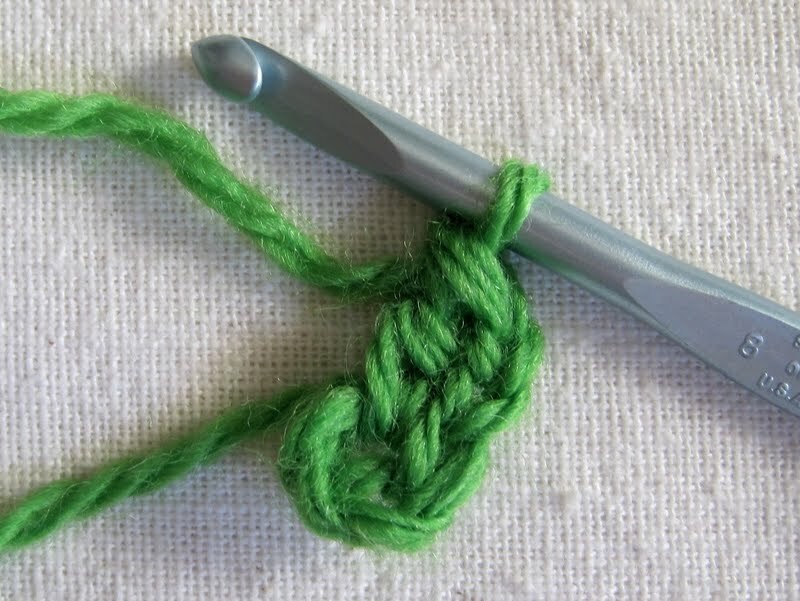 Make sure your next stitches go into the space below this strand. 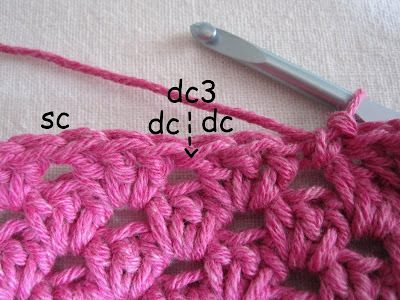 Double crochet 3 in each side space between corners. In next corner space, make corner same as Round 2 (dc 2, hdc 1, chain 1, hdc 1, dc 2). Note: Be sure you don't add any chains between the 3-dc clusters - chain 1 at corners only. Finish round the same as Round 2 (dc 2 in final space, hdc 1, join with single crochet to first dc). for a total circumference of about 16". The crown of the hat is done. Now it's time to start stitching the sides. 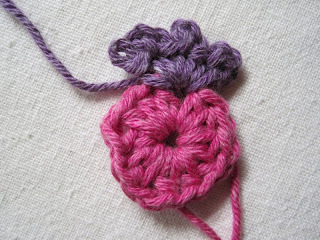 First Even Round: Chain 2, half-double crochet, double crochet in same corner space. Repeat from * to * around. When you get to the starting corner space, do not make any extra stitches in it. Just join with a single crochet to the first half-double crochet (skipping over the chain-2). Chain 2, then double crochet 2 in same space. Double crochet 3 in each space around. (No more corners!) 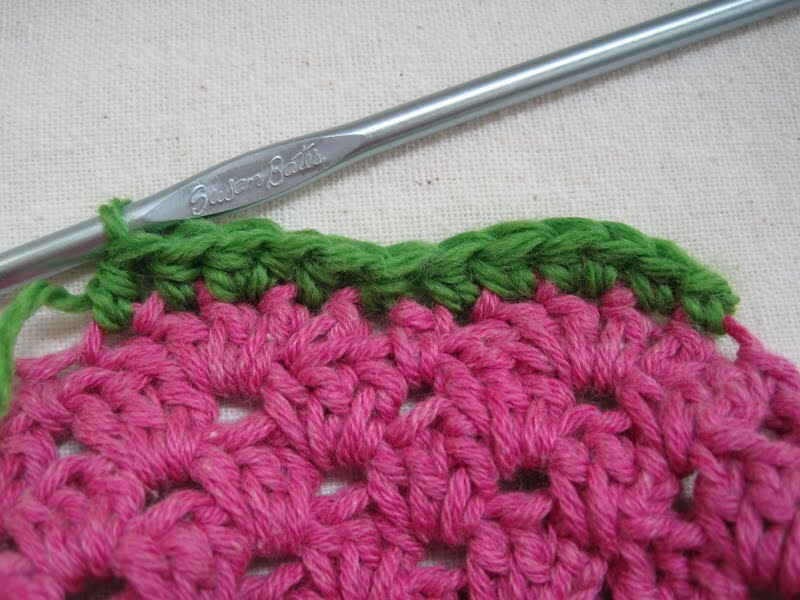 Join with single crochet in top of first double crochet. Work even until hat is about 1 1/2" shorter than desired finished length. Now it's time to add some shells, which will set us up for making the wavy brim. 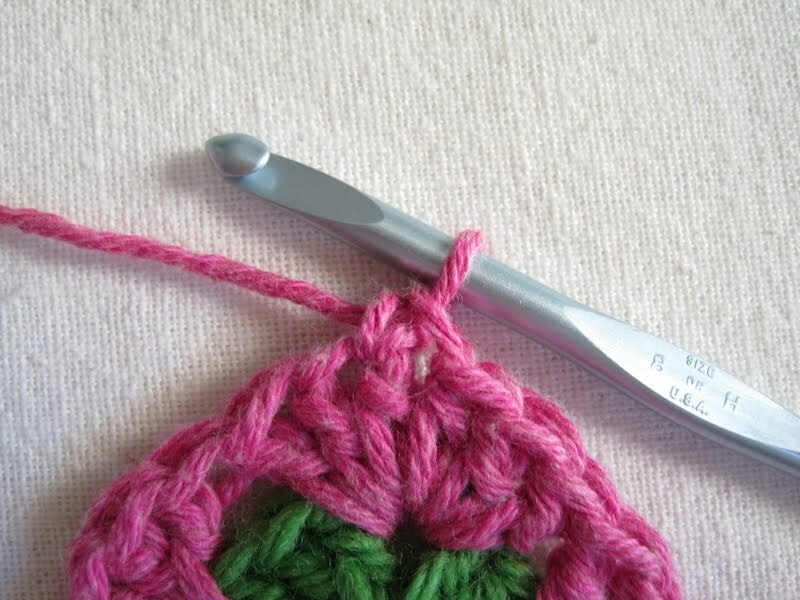 Single crochet in same space. Repeat from * to * around. 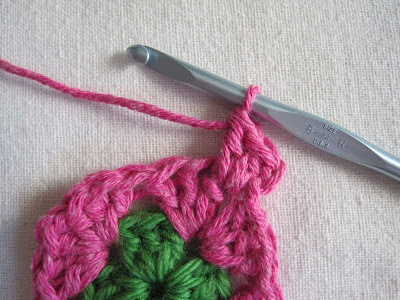 When you reach the end of the round, do not make a single crochet in the starting space (there's already one there). 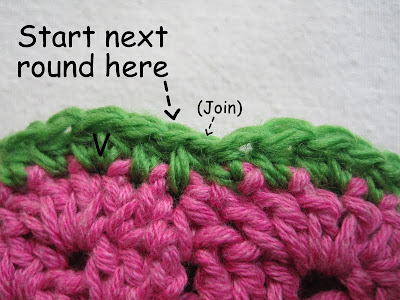 Cut yarn and join with invisible join to first double crochet (skipping over first single crochet). Some Wavy Trim Notes: Just as each shell contains 6 stitches, so does each "wave". 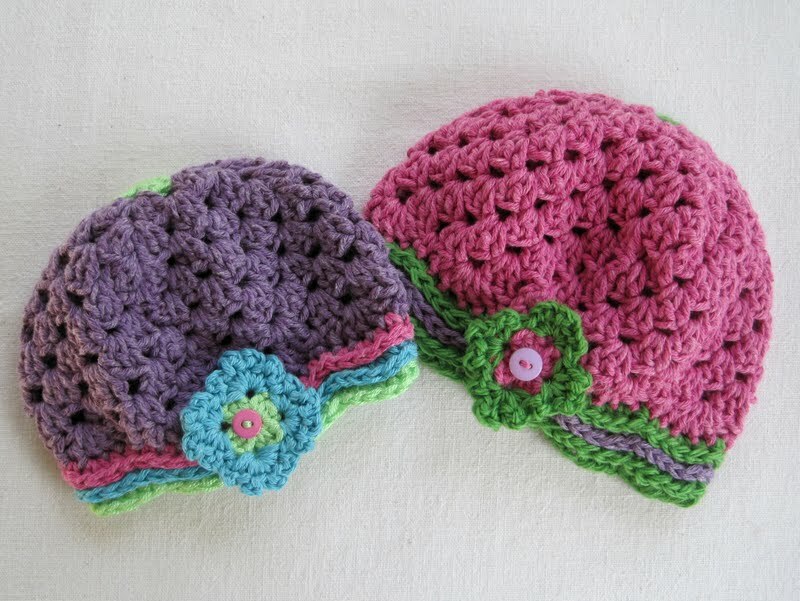 But the shells aren't flat - they've got humps and valleys. To follow these curves, we're going to increase at the top of each hump, and skip a stitch at the bottom of each valley. The increases will always be made in the 2nd increase stitch of the row below; the skipped stitch will always be the single crochet from the row below. 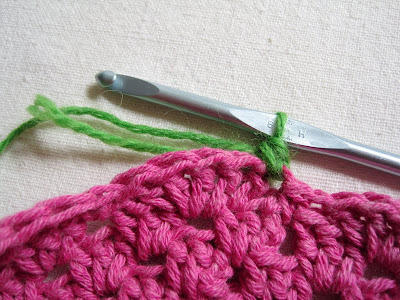 Attach new yarn with Knotless Standing Single Crochet in the double crochet just after a single crochet. (If you want all your yarn ends to be in the same place, use the same dc you joined to at the end of the previous round). 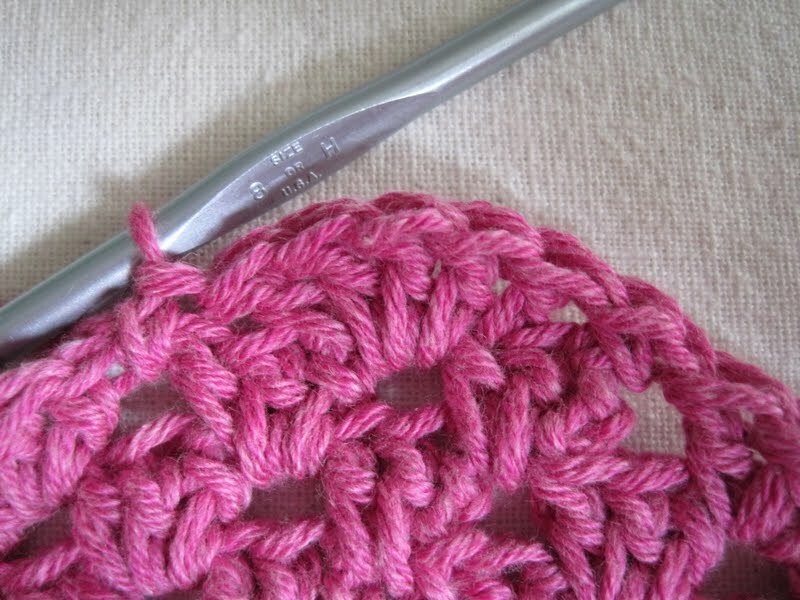 Half-double crochet in the next st, half-double crochet 2 in next stitch (increase made), half-double crochet once in each of next 2 stitches. *Skip 1 stitch; single crochet in next stitch; half-double crochet in next stitch, increase in next stitch, half-double crochet in next 2 stitches*. 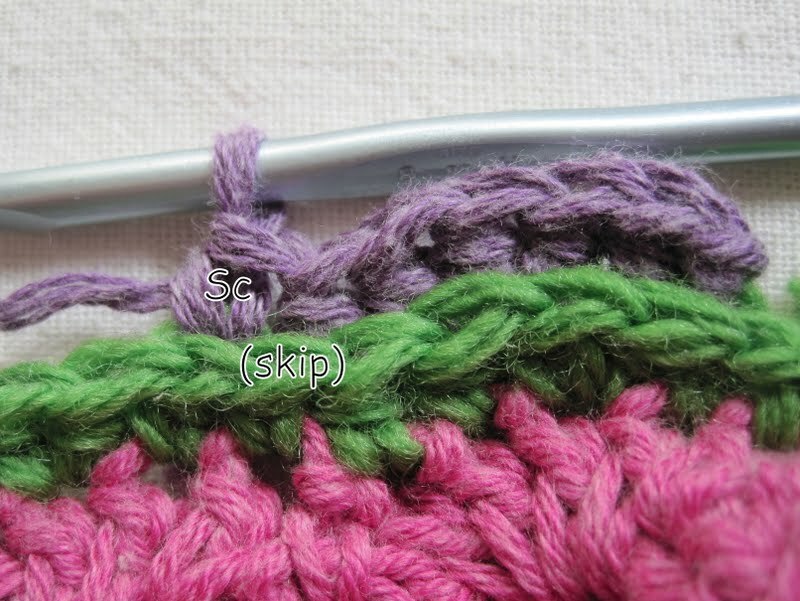 Cut yarn and join with invisible join to first half-double crochet (skipping over the starting Kssc). Remaining Wavy Trim Rows: Same as Trim Row 1, except all stitches are made in back horizontal bar of stitch below. 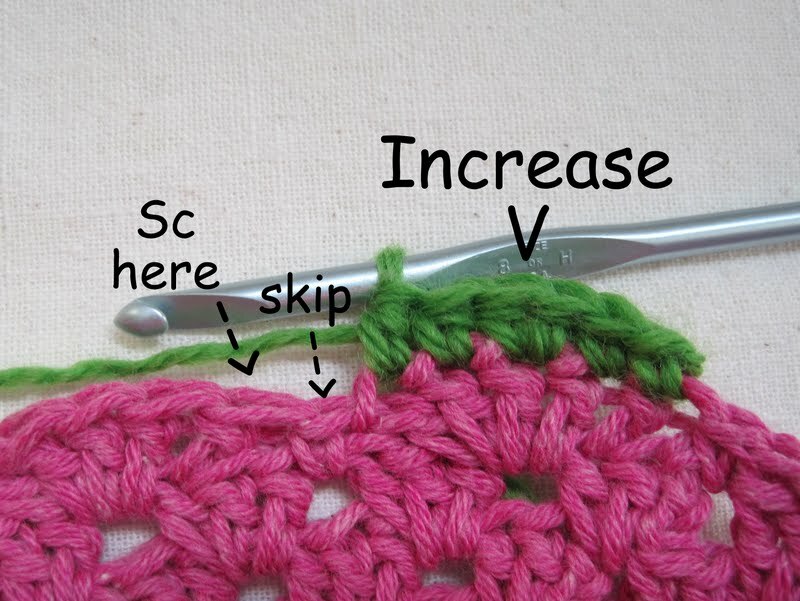 Don't forget - your increases will always be made in the second increase stitch of the row below, and you will always skip over the single crochets in the row below. 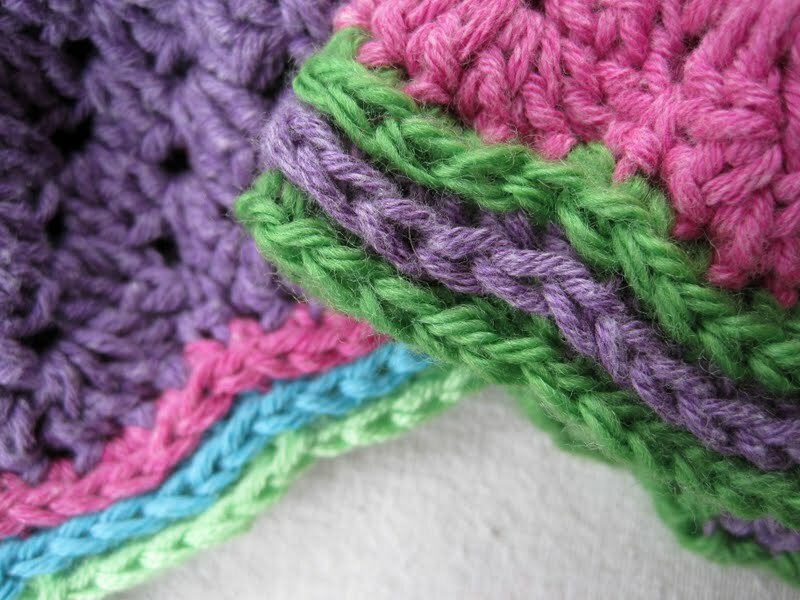 Make as many Wavy Trim rows as desired, always joining with invisible join to the first half-double crochet of the row (not the starting stitch). When Wavy Trim is complete, weave in all ends, and admire your cute little Waving to Granny hat. Block if necessary. 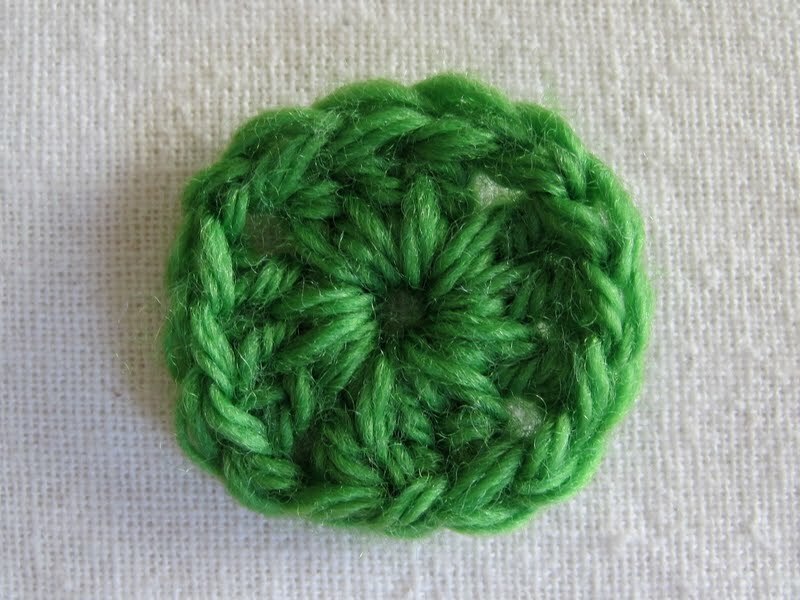 Optional Granny Picot Blossom: Leaving 6" tail, make core as Round 1 above, with half-double crochets instead of double-crochets. Leave another 6" tail when complete. *Single crochet in next corner space. (Chain 3, single crochet) 3 or 4 times more in corner space to equal number of picots in first corner space*. Repeat from * to * around. Do not chain between corner spaces. 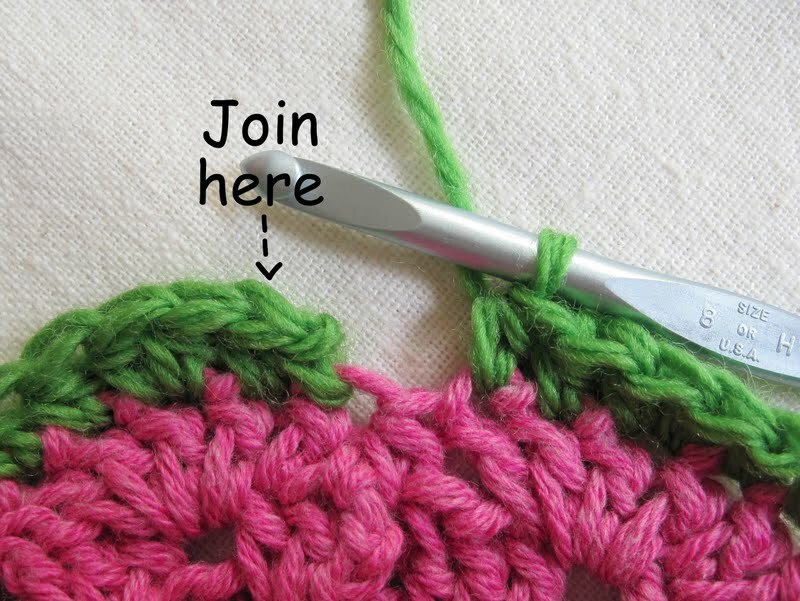 Cut yarn and join with invisible join to first Kssc. Use long tails from core to attach button to blossom and blossom to hat. 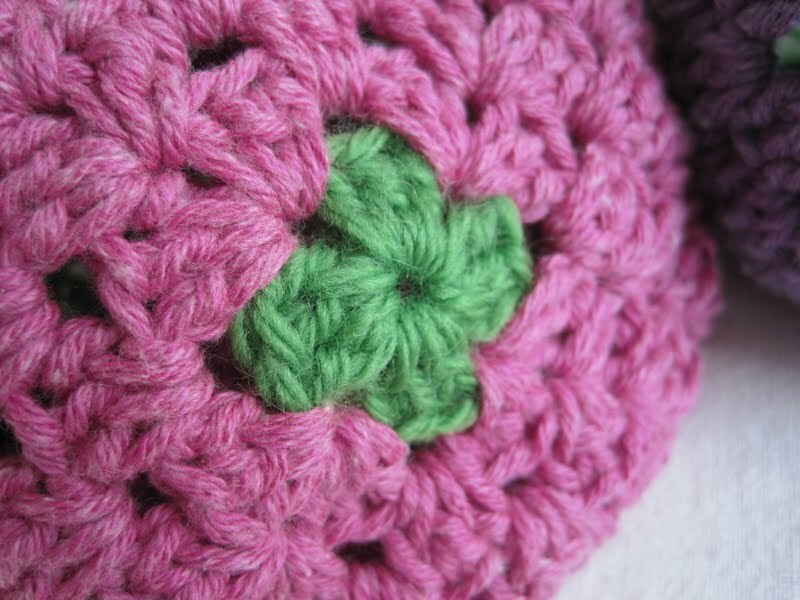 You may do whatever you like with the items you make from this pattern, but you may not sell the pattern. If you have any questions, or find any mistakes, feel free to use the comment box below, or contact me in Ravelry (where I'm MrsMicawber). 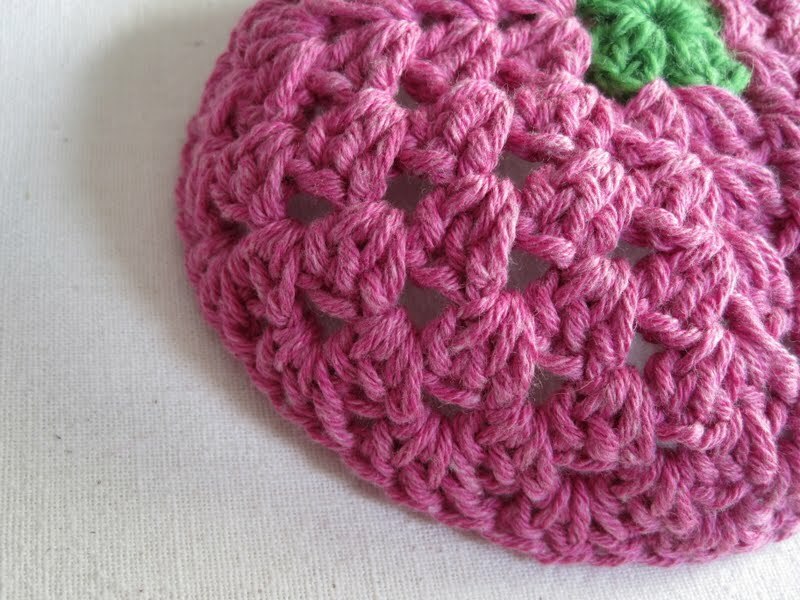 Thanks for viewing, and happy crocheting! Thank you for the explanation.. perfect. Being *Crafting Impaired,* I did not read all the instructions. But I'm sure they are wonderful, for people who CAN do such things. Visual learners of the world, unite! Your directions and pictures are always so clear, how do you write on your pictures? What gorgeous hats and I love your instructions. 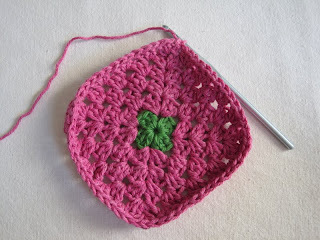 I haven't crocheted for a long time but I just might give this a go as I also have a new niece! What a pretty hat. 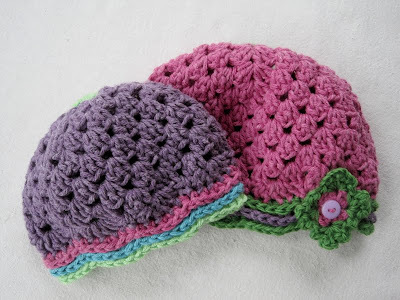 Might go stash diving and make one for me. I will be going to a shower in a couple of months for a baby girl...I have to maaked this hat. I love the shell stitch on the edge and then the pretty colors. Whenever you do I tutorial I am convinced that I can make the project. LOL. I better get busy Because I still have to make the slippers. With the cool weather, I will need them now. Oh, my gosh those are so incredibly cute!!! You are really going to have one well-dressed niece! Thank you for sharing this pattern. 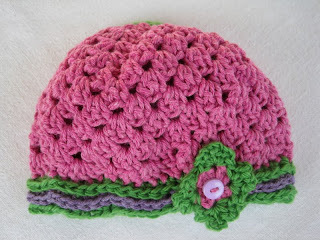 I made a hat for my 5 yr. old from this pattern and it turned out beautiful! Thanks again! Hello! Thank you very much! Your tutorial and the description are so detailed. 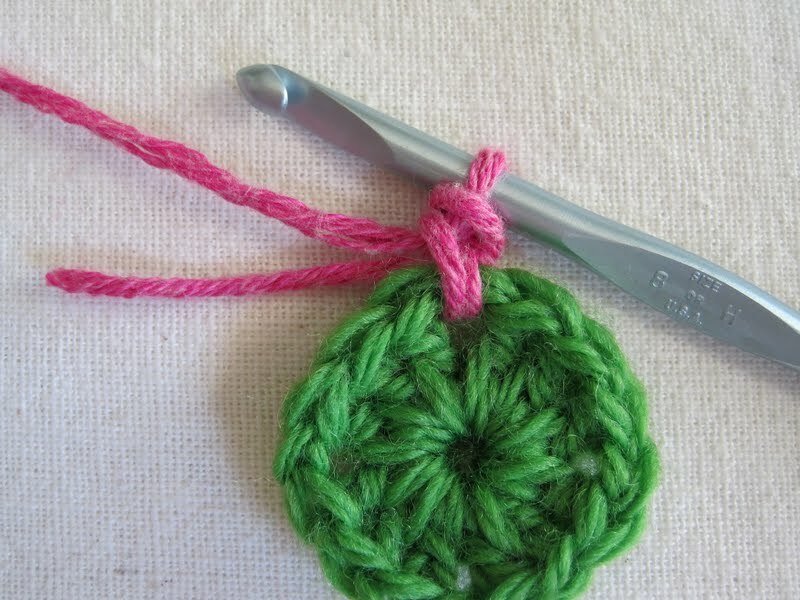 Now I know the perfect method for joining rounds while crocheting granny squares, or something else using the granny stitch. As well your hats are in very pretty colours combinations. I'm crocheting a lot of similar hats but never in two colours or more. I love your idea with the wavy trim! I have to try. Today. Thank you a lot again and I wish you have a wonderful weekend.